Depends on the bike's color scheme. Post a picture of your bike? well i don't have it finished yet but i can post what i want it to look like. 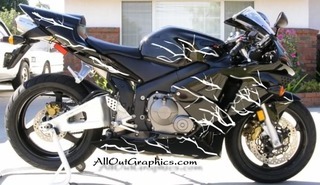 its a 2000 cbr 600 f4 n its gonna be all blacked out with lightning graphics, and white brake calipers. no opinions at all guys??? now i know some of you from reading threads are extremely opinionated (not in a bad way, u just know what u like). With the graphics you want, I like the tapered stripes. I have solid stripes on mine, but it doesn't have the cool lightning. thats what i was thinking, myself. plus, i never saw the tapered ones before. i might buy both n mock them up to see what looks best. Tapered looks great. Aren't they pretty cheap? Just put them on and skip a step. Or try one of each kind on each side of one wheel, just to get a feel. I agree.. ordinarily I would say solid stripes, but after seeing your paint scheme, the tapered would probably set it off nice. 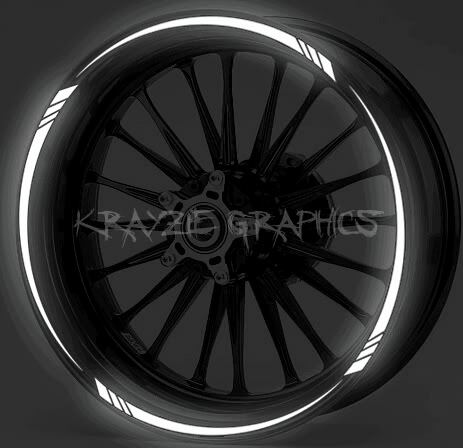 Those would be wicked sick if they came in reflective. I like the tapered look. Quick Reply: wheel stripes- solid or tapered? ?